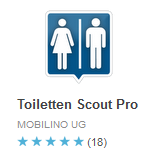 Our application “Bathroom Scout Pro” not only got a great test result from german PC World but is also rated very good in the Google Play Store. 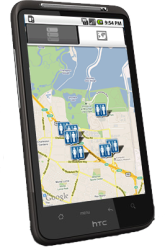 With it’s currently over 600.000 places and it’s big active user community (which adds new bathrooms, rates bathroom facilities and reports missing ones) Bathroom Scout is one of the best and most substantial apps to search for (public) bathrooms all over the world. Especially the possibility to navigate to places as well as the satellite view makes the app a practical companion for everyday life. Convince yourself and download the App from the Google Play Store!